Today’s customer journey is far from being linear. There are hundreds of touchpoints between a customer knowing about your product to when they are ready to hit that buy button. This presents unique challenges for brands who must innovate continuously to stay relevant. To support the velocity and amount of information needed by real-time use cases, brands need to develop a viable production system that allows for previously unknown workloads and data flowing through the system. This whitepaper will walk you through all the essential components of CleverTap’s scalable platform. Its proprietary architecture that benefits from proven data ingestion, processing and messaging systems that contrast traditional workflows and facilitate the increasingly prevalent real-time use cases of today. 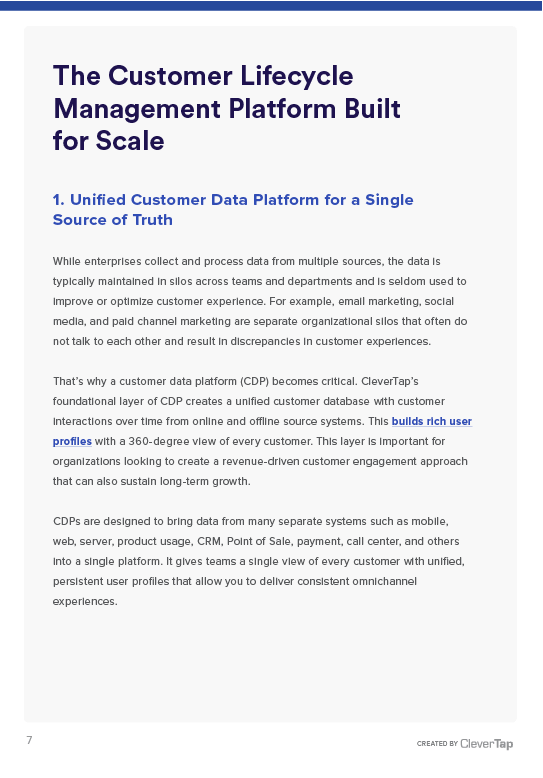 CleverTap’s foundational layer of CDP creates a unified customer database with customer interactions over time from online and offline source systems. Deliver the power of data science to marketers so they can answer key business questions with insights generated from millions of rows of customer data. 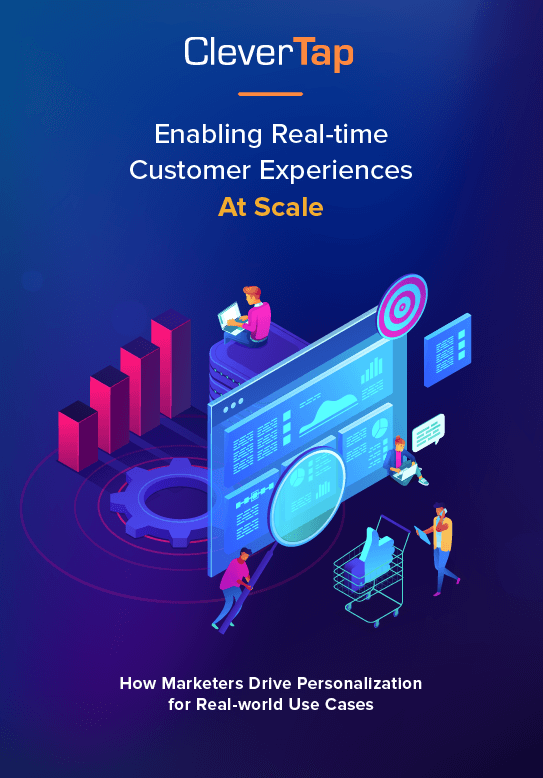 With advanced data science and ML-powered features, CleverTap helps the forward looking brands create engaging experiences for users. Engage users on external and internal channels with one-time campaigns or long term campaigns throughout the customer journey. Customer trust and data privacy are at the core of what we do. We are backed by a system architecture built for guaranteed uptime, with globally distributed data centers for redundancy. "Since integrating CleverTap, we’ve increased CTRs by 5% and subscriptions by 10%. Having analytics and engagement on the same platform has been critical to our customer acquisition and retention." "CleverTap’s data-driven mobile marketing suite continues to play a crucial role in our growth. 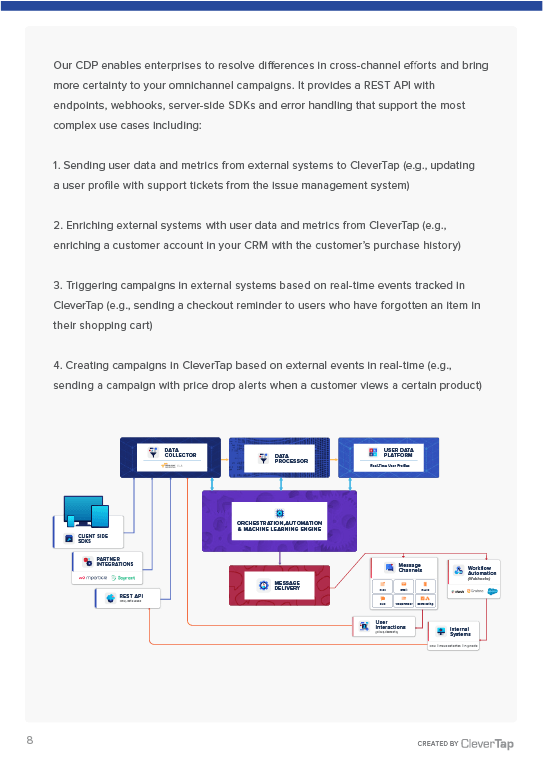 Using CleverTap we have been able to run omnichannel campaigns for a diverse set of use cases." "CleverTap’s impact is clear: our conversions and traffic have increased over 50% in the last several months. CleverTap is a trusted partner for BookMyShow. Their advanced mobile CRM lets us implement complex yet easy-to-set-up automated campaigns for our users." "We can look at the users’ journey across multiple devices: from the web, to their phone, or their tablet. This not only provides us with a single view of the customer but also improves engagement and the user journey across channels and devices." "Cleartrip is building a culture of digital transformation by combining cross-functional data. 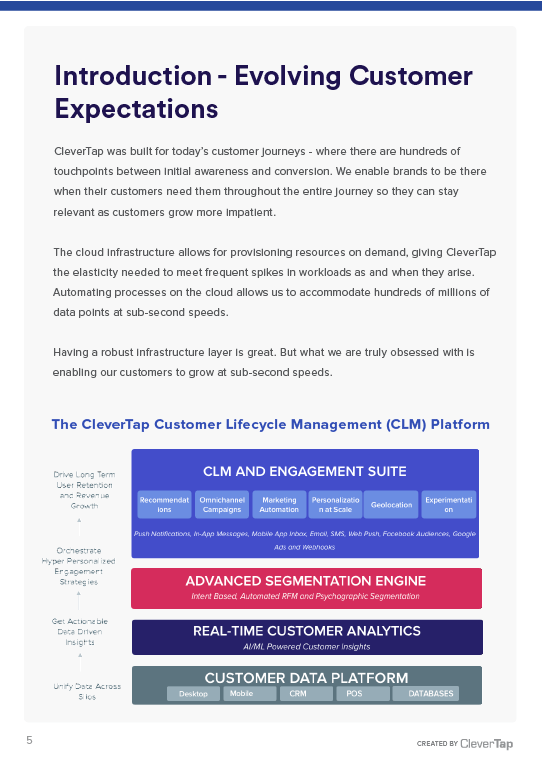 CleverTap's marketing growth platform enables us to correlate data across devices and engagement channels for a KPI driven customer engagement strategy." "CleverTap helps us implement the data-driven culture that we strive to maintain. Their powerful analytics suite helps us accurately identify, understand, and even predict user behavior. It’s been a significant asset in achieving our business objectives." "The retail industry is undergoing complex changes, with new solutions and technologies emerging to improve consumer experiences. CleverTap helps us create more dynamic and innovative user experiences. We now engage our users every day with personalized, automated campaigns that have significantly reduced churn." "CleverTap is the perfect platform for any growth hacker. It’s not just about analytics and segments — they work with you on clever campaigns, optimization, and how to use your data better. They have perhaps the best support team for deep dives and issue resolutions." "At HealthifyMe we believe in a data-first approach when it comes to engaging our users and CleverTap's robust features help to extend our segmentation to optimize the impact of our engagement campaigns." "CleverTap’s multi-channel marketing suite enables us to engage with real-time customer insights that help make informed marketing decisions. Having a technology partner who believes in our core value proposition helps us accelerate our efforts rapidly"
"At Mobikwik, we use CleverTap's mobile marketing capabilities extensively to engage better with our users. With CleverTap, we can run powerful contextual and personalized campaigns and our retention rates have significantly improved ever since." "Thanks to Clevertap's ability to handle large volumes of data we have been able to scale our userbase 10x in the last 12 months without worrying about our real-time analytics solution." "With CleverTap Pivots, we are able to cross-tabulate data across billions of data points in no time. This enables us to gain valuable insights that we can leverage to provide better recommendations around our entire solution suite - from keyword research, ASO promotion, A/B testing, sentiment analysis to much more."